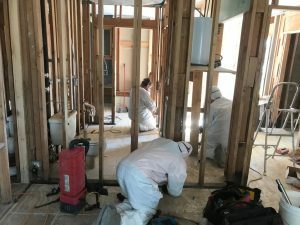 Water damage and mold infestations go hand-in-hand and for owners of commercial properties in Kansas City that can lead to structural issues and health risks that can be severe enough to warrant professional remediation services. 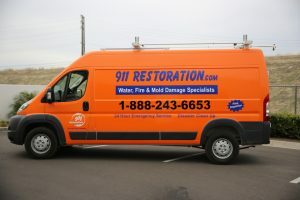 911 Restoration Kansas City understands the magnitude of situations involving both mold and water damage, so we always act quickly when a customer calls us for either of these issues. If you discover water damage in your building, you can call us literally the moment you find it, because we are available 24/7/365 to take your calls. We guarantee to arrive within 45 minutes of receiving your call for disasters involving water because we want to limit the severity of the damage. The sooner we clean up the water damage, the better the chances are that we can prevent mold from growing, especially during the summer when the conditions are perfect for creating mold infestations. Our commercial property damage Kansas City technicians are qualified to provide comprehensive services that deal with both mold and water damage, along with working with IICRC certified experts. So, call us today and we will make sure you get the fresh start you need to fully recover your business. Lansing has a subtropical climate that is characterized by hot summers with high humidity. It is typical for the area to experience bouts of rainfall during these months, making the moisture level in the air very strong. Whenever there are warm weather and humidity, there is the possibility of mold to grow indoors. If you own a commercial property, then there are certain types of molds that tend to grow in these environments. It is also common for buildings to become water damaged either by rain or some internal means, such as a pipe burst or roof leak and when that water damage goes unmitigated, even for a small period of time, it can spark a mold infestation. Completely dormant mold spores can begin to flourish within 24 hours of being exposed to moisture, which is why it is so important to keep your commercial property well-maintained and as dry as possible throughout the year. 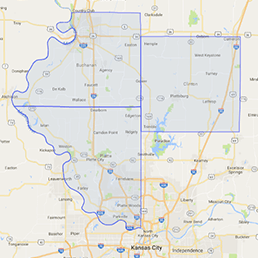 911 Restoration Kansas City treats mold infestations with urgency, not only because of their ability to impact the property but due to the health risks it imposes on anyone who inhales the particles. So, call us today and we will provide you with a free visual mold inspection. There are different types of molds that present certain health issues. Some mold species can be quite dangerous, even fatal, such as black mold, while others may just cause you to experience allergy-like symptoms. In order to determine exactly what type of mold is growing in your commercial property, we make sure to test the spores. This way we can be absolutely sure what the risk level is in the building and what measures need to be taken to properly decontaminate the area. Along with creating health issues for those breathing in the mold, an infestation can impact the structural integrity of your building. Mold survives by eating organic materials commonly found in a commercial property, such as wood, cardboard, and paper. When mold infests an area for a significant amount of time, it can eat away at parts of the home, causing rot and rust. To prevent these issues from becoming severe, 911 Restoration Kansas City will react quickly to remove every trace of mold from the premises. Keeping you safe is the most important part of the job to our commercial property damage Kansas City specialists, so call us the moment you notice any signs of mold growth in your building.